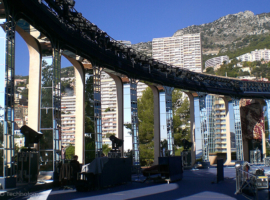 In Monte Carlo, Monaco, the World Music Awards 2010 took place on 18th May, 2010. For the international award ceremony A&O Technology Germany delivered twelve xenon flower 2.000W effect floodlights. 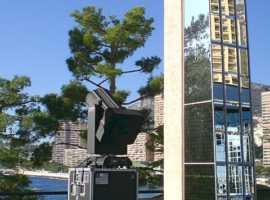 With the xenon multibeam projector A&O already supported the WMAs of the years 2006, 2007 and 2008. Responsible for the lighting design was mo2 design. At the WMAs annually international successful musicians of different music categories were awarded for the highest recorded sales volume. 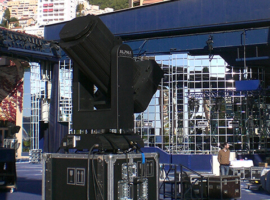 A&O Technology supplied and installed a total of 14 FALCON® FLOWER 3kW for the World Music Awards 2007 in Monaco. The project took 5 days from construction to dismantling. During this time, A&O supervised the installation and lighting of the FALCON® lighting systems. 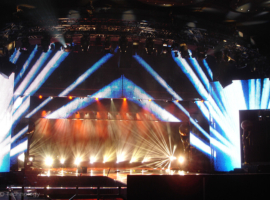 Lighting designer Manfred “Ollie” Olma (mo2 design) developed the lighting design and operating for the event. 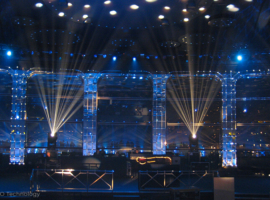 A special feature that made the planning of the lighting design more difficult was the high number of mirrored wall elements that were used in the studio location on site. 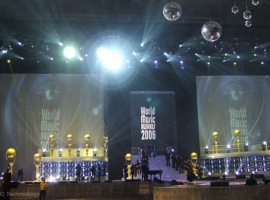 The prizes at the World Music Awards are not awarded through a voting procedure, but on the basis of sold sound carriers. Artists such as Rihanna, Akon, Avril Lavigne, Laura Pausini, David Guetta and Cascada were present at this year’s event. 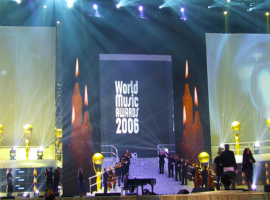 On 15 November, London will be honoured to be part of the venue for the World Music Awards 2006. The annual awards ceremony will take place this year at Earls Court London. Presented by Lindsay Lohan, the 18th Awards will feature prizes for most record sales worldwide, the two special awards Diamond Award, for album sales of 100 million copies worldwide, and Legend Award, for the overall contribution to the global music business. The most successful national artists in music countries with a large music market are also honored. The proceeds from sponsoring and television money go to the Monaco Aide & Presence Foundation under the honorary chairmanship of Prince Albert II. 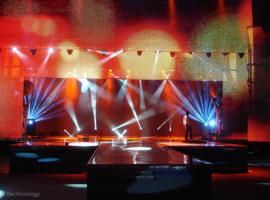 The lighting designer Manfred “Ollie” Olma (mo2 design) is responsible for the lighting design of the WMA and relied on the xenon lighting systems Target Spezial from the rental park of A&O Lighting Technology GmbH. 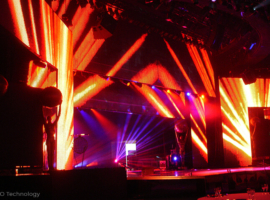 The service provider for event and architectural lighting delivered a total of 26 targets to the Earls Court in London. 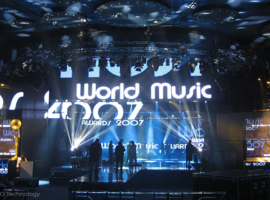 Channel 4 will broadcast WMA 2006 on 23 November and a 2 hour special will be broadcast in 160 countries.